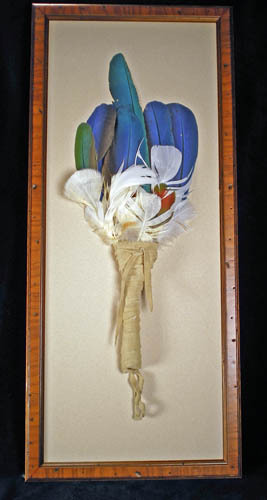 It is offered as an unauthenticated decor item, with parrot feathers and a wrapped hide handle. It has been mounted on a handsome presentation frame for easy hanging in your home. It is sure to attract the eye of guests and generate intersting conversation. Size: approx. 21" h x 9 1/4"